Our professional mentors, Louis and Patrick, held a plumbing workshop for us at Net Zero Solar here in Tucson. We learned some basics about working with PVC, copper piping, and drip irrigation. Shout-out to Christian and Francisco for the longest-shooting marshmallow blaster. We also made some "Pinterest-worthy" copper pipe sculptures that we soldered together. As a club, we're gonna try to hold more workshops like this (fun and educational). You can learn a lot about design in the classroom, but experiences like these are the best way to learn skills necessary for our implementation trips. If there's anything you'd like to learn, through a weekend workshop or in-meeting talk, please drop us an email! After a brief hiatus, our Noche Dominicana fundraiser is back at Stillwell House & Garden. Join us March 31st for dinner, entertainment, and a silent auction. What is Noche? Firstly, it is a fundraiser for the costs incurred by our international and domestic development projects. We currently have an irrigation project in Sabana Mula, Dominican Republic. We've completed two assessment trips and are working on finalizing the system's design before moving into the implementation phase. We also have an irrigation project here in Arizona at the San Carlos Apache Reservation, a project that is still in the design phase. Not only is Noche a fundraiser for our projects, but a chance to network with students, professors, and professionals from all around Tucson. On top of that, it's also a great night to have fun. Tickets are $80, and can be purchased by emailing us or at the door. In January 2017, EWB-UA completed the first in-country assessment trip for the Dominican Republic project. On arrival, the team discovered a well-organized community with high social capital. The community has committees that handle everything from water to funerals. The community is forming another committee specifically for this project that will use its membership fees to maintain the irrigation system. EWB-UA will return sometime next year to perform land surveying and collect other technical data needed to begin the design. Come join us for our annual benefit dinner on April 9, at Casa Vicente's! In addition to learning about our chapter's progress in our new project, guests will enjoy Casa Vicente's delicious food while enjoying live music. This will be an especially exciting annual dinner as we have moved on from our Bolivia project and onto a brand new project in the Dominican Republic. 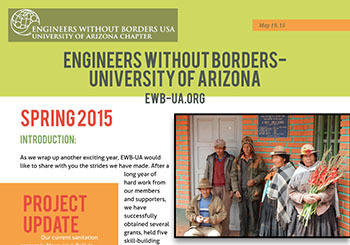 Please contact us at ewb.arizona@gmail.com for ticket reservations. ​The 543 Work Plan for the San Carlos Apache Reservation irrigation project has been submitted! EWB-UA has been working with local non-profit organization Nalwoodi Denzhone for the past few years on a design to benefit the community. The project has been divided into four different subsections including family gardens, large-scale crop cultivation, orchards, and areas for raising animals. Our hard work on the 543 Work Plan has finally paid off and we look forward to any new developments on the project! This year has been full of awesome new volunteer opportunities right here in the Tucson community! We've worked with organizations like Casa de losNiños, Ishkashitaa Refugee Network, Z-Mansion, Amphi Middle School and Agua Prieta hosted EWB-UA students. We helped clear out attics, sold fruit at Tucson farmer's markets, serve breakfast to some of Tucson's homeless, taught middle schoolers the importance of infrastructure engineering in developing countries, and helped construct roofs and buildings in Agua Prieta, Mexico. 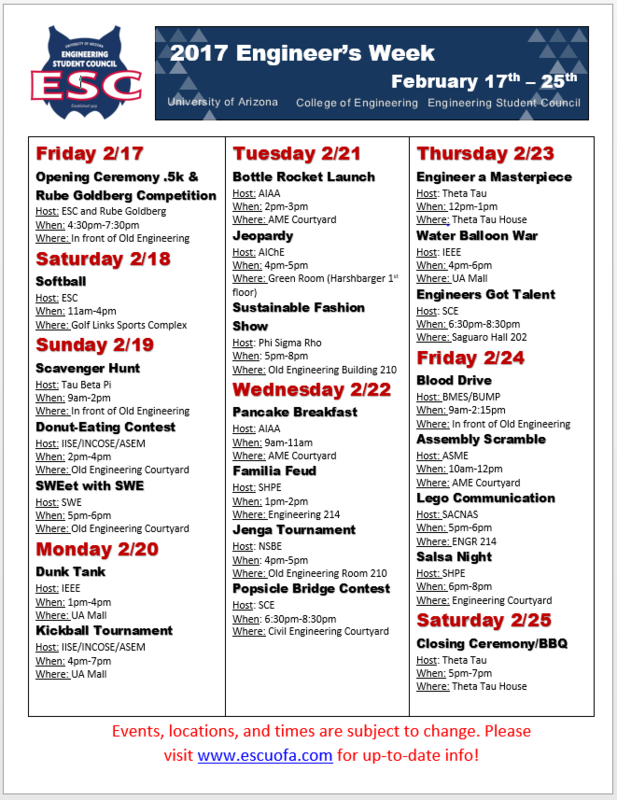 We are thrilled to say that we have no shortage of volunteering events for next semester. On the line-up includes Habitat for Humanity events, another Agua Prieta trip and much more! Know of any great organizations we can volunteer with? Shoot us an email and we'd love to check it out! ​Our annual Frisbee Without Borders (FWB) fundraiser was a success with more than 50 participants. Thanks to the hard work of the fundraising committee, FWB was a ton of fun with tie-dyeing, plenty of prizes, and friendly competition. Thanks to the teams that came out to support EWB and thank you to the members who made the event such a hit! Stay tuned for our spring fundraisers! ​One of the really cool aspects of being a dues-paying member is being able to participate in educational workshops! Our latest one on soil characterization was not only very informative, but tons of fun hanging out with fellow EWB-ers from both UofA and ASU and having an excuse to play with mud! Stay tuned for a list of very awesome tours and workshops we will be setting up this spring semester! In addition to volunteering and working on projects with one another, members of EWB-UA are always encouraged to attend our social events! Whether it be a holiday party or an outdoor BBQ grill day, we like to incorporate fun and bonding into our club activities at the UofA. EWB-UA encourages student engagement through strengthening the connections between members so that they feel welcomed, supported and appreciated. Our social events are a great way to get to know the professionals who assist our projects in a much more inviting way and to meet like-minded people who share your interests. Our last event was a BBQ held in the Engineering Courtyard where students got to enjoy some great food and talk with fellow club members as well as people like the Dean of Engineering who stopped by for a burger! ​To sum up the 2014-2015 year we created a newsletter that covers all of our major events, project updates, and graduating members. Be sure to check it out! A special thank you to all of our sponsors and partners. Our chapter claimed second place in the e-week competition this year, continuing a long history of success in this competitive set of engineering games between student clubs. We also won the food drive and photo contest thanks to the support of club members, Jake Garan's photography, and over 140 pounds of peanut butter. 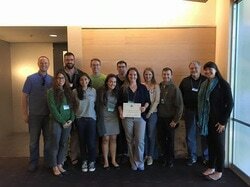 Besides being a blast and an opportunity to network, we also earned valuable prize money for our club. We were featured in the University of Arizona College of Engineering's recent video on diversity in engineering, which included interviews with two of our officers. Check out what drives our members as well as what diversity means to us.